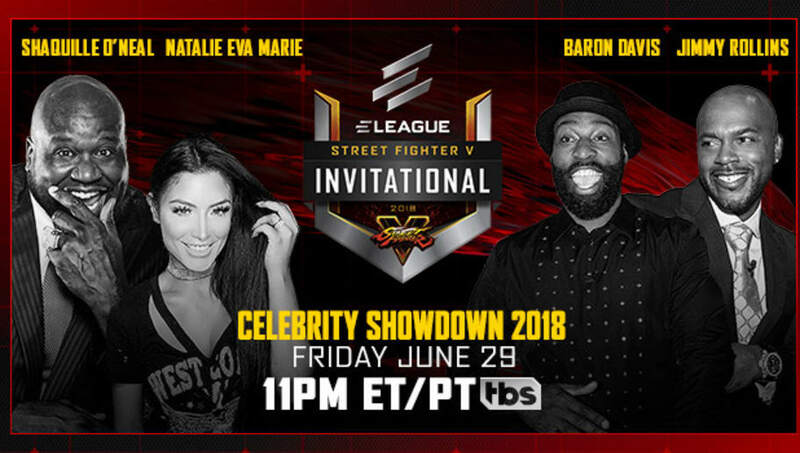 The Street Fighter V Invitational 2018 Celebrity Showdown​, featuring Shaquille O'Neal, Natalie Eva Marie, Baron Davis and Jimmy Rollins, will take place Friday at 11 p.m. EDT, ELEAGUE announced Thursday. The players will compete in a single elimination bracket for the charity of their choice. O'Neal will compete for the Odessa Chambliss Quality of Life Fund, Rollins for the Jimmy Rollins Family Foundation, Davis for the Drew League, and Marie for A21. The winner will earn the majority of the prize pool for their charity, but each charity will receive a portion. ​​Each player will be coached by one of four ELEAGUE ​Street Fighter V ​Invitational analysts including Steve "Tasty Steve" Scott, Zhi "Zhieeep" Liang Chew, Stephen "Sajam" Lyon and Reepal "Rip" Parbhoo. Josh Gray will emcee. Last year's Invitational ended in controversy when, in the finals between O'Neal and Marie, O'Neal's coach Tasty Steve took the stick in his own hands to aid in the upset over avid Street Fighter player Marie. The two are set to face off once again in a hotly anticipated rematch during the broadcast Friday.